Cooking tofu can be a mystery for many people, but it does not have to be difficult. Tofu can provide you with a rich source of nutrients such as calcium and especially protein. By learning to cook tofu, you can use it to replace high calorie, high saturated fat and high cholesterol meat-based foods in some of your meals. When cooking tofu, it is important to remember that tofu is flavorless and will take on the flavor of what you cook it with. Tofu can be made into a vegetable-infused scramble and eaten as a substitute for scrambled eggs. This is a cholesterol-free, high-protein and high-fiber way to enjoy tofu. Dice up 3 or 4 cups of your favorite vegetables, such as onions, peppers, tomatoes, squash and broccoli, and place them in frying pan with a little bit of olive oil on medium heat. Then, drain and crumble a block of firm or extra firm tofu. 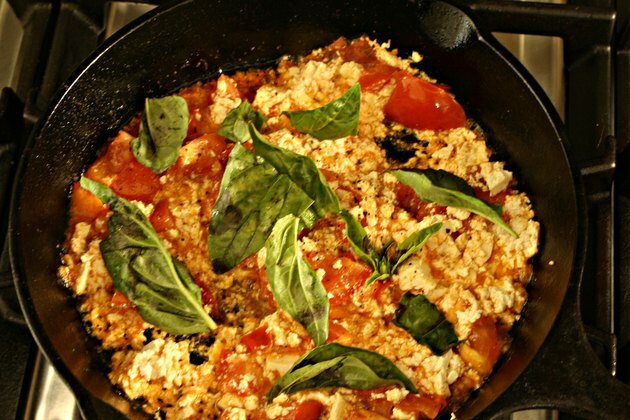 Add the crumbled tofu to the frying pan and mix it in with the vegetables. To add flavor, mix in a small amount of vegetable bouillon with water. Add the bouillon to taste and allow the scramble to cook down until you achieve an egg scramble-like consistency. This may take close to 20 minutes. Tofu is a low-fat and cholesterol-free grilling option. 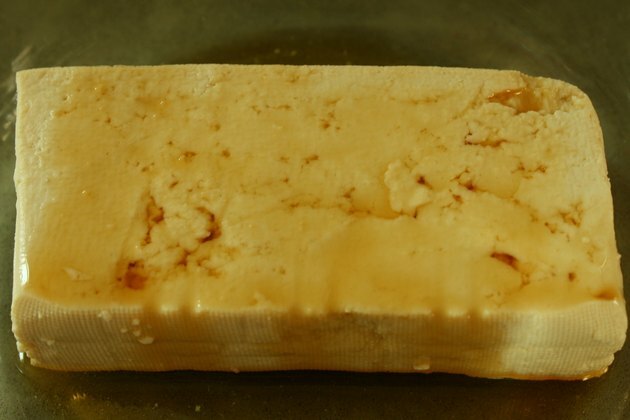 Slice a block of extra firm tofu into slices, about an inch or two in thickness. Cover the tofu slices with your favorite marinade or seasonings such as barbecue sauce, olive oil and Cajun seasonings, or garlic. Let the tofu sit in your flavoring for an hour or two. The longer you allow the tofu to soak up the seasoning, the stronger the flavor will be. Once marinated, place the tofu slices evenly on the heated grill. Grill on both sides for a couple of minutes. Remove from the grill and serve over rice, alone, or on a sandwich. By covering tofu slices in a small amount of cornstarch before cooking, it will become crispy. Slice a cube of extra firm tofu into thin cubes or slices ,depending on how you want to end on how you intend to use it such as in a stir fry or on a sandwich. 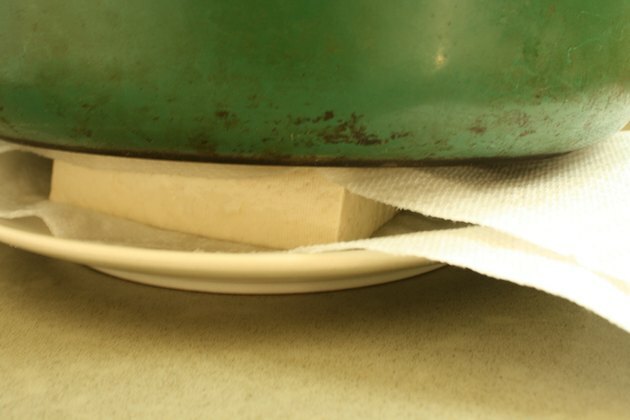 Eliminate the extra water from the tofu by placing the slices between several paper towels. Then, place a heavy pan, weighing about 10 pounds, on top and let the tofu sit for at least 15 minutes. This helps remove the excess water. Once the water is removed, cover each side of the tofu in a thin coating of cornstarch and place in a heated frying pan. 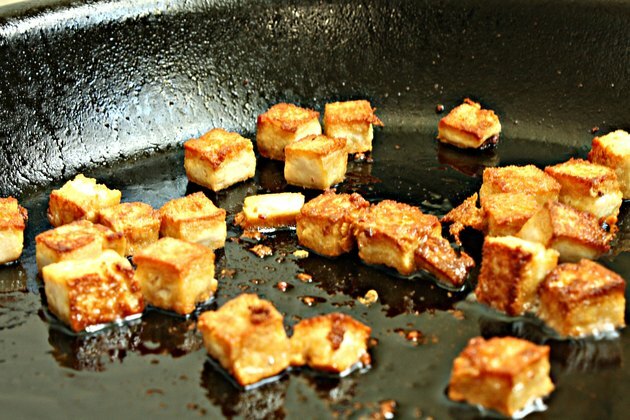 Fry until the tofu becomes crispy and slightly brown. 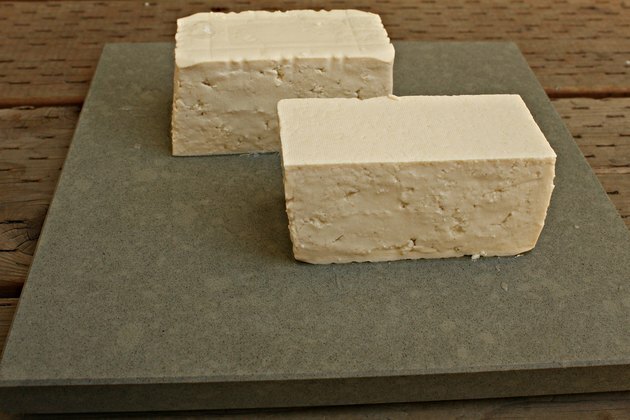 You can also bake tofu slices to use on salads or serve as a simple snack. Drain a cube of extra firm tofu and slice it into 1/2-inch slices. Then, eliminate the extra water from the tofu by covering with paper towels and a heavy pan, the same way you did to make crispy tofu. Next, flavor the tofu by placing it in a bowl with your favorite seasonings such as soy sauce, chili paste or sweet and sour sauce. Allow the tofu to soak up the seasonings for about 30 minutes. Place the tofu slices evenly spaced on a cookie sheet and put the pan in an oven preheated to 350 degrees F. Let the tofu bake for 25 to 50 minutes. Flip the tofu every 15 minutes to make sure that both sides are thoroughly cooking.